Carolina Crown earned top honors and made a statement Saturday, recording a score of 95.25 on the second day of the DCI Eastern Classic in Allentown, Pa. Crown ended up just half a point shy of the Blue Devils' score from the day before, drastically closing the 2.65 point gap between the corps just one week ago at the DCI Southeastern Championship in Atlanta. While two different competitions were presented in Allentown this weekend, performances from all of the World Class corps were scored by the same panel of judges, giving fans the opportunity to make direct comparisons between the nights. "It's really exciting to come out of Allentown on top tonight and with such a big number," said Carolina Crown drum major Blake Daughtrey. "But it's really about our standards that we work for, so while we're happy with tonight's results, we're working toward our ultimate goal, which is a perfect performance." 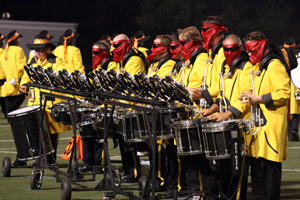 Santa Clara Vanguard took second place at the event with a score of 93.80. The quest for perfection is a common goal; Santa Clara Vanguard front ensemble section leader Andrew Jarvis said that flawlessness is the corps' target going into the World Championships as well. "We're going to keep trying to perfect the show as much as we can and make sure we give it our best. I think we're getting closer and closer [to that level of perfection] every day, and we'll see what happens," he said. Madison Scouts tuba player Derek Schmidt also said his corps' sights are on perfection as the final week of the season draws near. "Perfection is the goal, and that's the goal of any drum corps," he said. "Obviously no corps ever gets completely perfect, but as close as we can get is the goal. If we come off the field this season with no regrets, that's perfect enough." Less than a point separated the corps earning third, fourth and fifth places, as Phantom Regiment (3rd, 89.55) topped Boston Crusaders (4th, 89.25) by two tenths of a point, and Blue Stars (6th, 89.00) nipped at their heels. 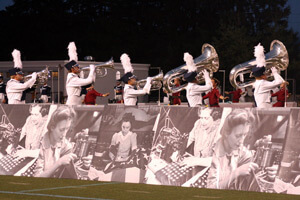 The Blue Stars, whose program, "The Factory," presents the experiences of factory workers in the 1940s and utilizes 36 sewing machine tables and other props on the field, continue to enhance their program and fine tune every detail in preparation for the World Championships. With just a week left in the season, volunteers for the Blue Stars created a factory of their own the last few days, churning out new elements for their stage set and color guard. "A lot of our volunteers spent the last 24 hours sewing together some monolith fabric props, more volunteers put together screens with pictures from the 1940s, and they've been adding on to these tables every day for the last month and a half," said Blue Stars bass drummer Patrick Currey. "It's those little enhancements that help bring 'The Factory' to life and help bring everyone back to the 1940s." Currey explained that since the DCI Eastern Classic falls so close to the end of the season on the calendar, this event gives performers a taste of what it will be like to compete at the World Championships in just a few short days. "There aren't a lot of words to describe it; It's a great crowd, great field, the warm-up area is just beautiful," said Currey, who is a first-year member of Blue Stars. "Our ultimate goal for when the season is over is to walk off the field, look everyone in the eye and say, 'That was it, there's nothing else we could have done." The Blue Knights (6th, 87.15) led the Colts (7th, 83.75), who were followed by the Madison Scouts (8th, 81.10). Crossmen (9th, 80.20), Spirit (10th, 79.95) and Jersey Surf (11th, 78.05) rounded out the bottom half of the competition. 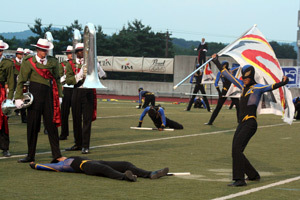 Crossmen drum major Megan Huber said the corps' 2009 season has been "a long push to the end. We've been working very hard on this show, and we've had several design changes. Tonight we actually added in a fifth movement to our show which we've never performed before today. So we are doing everything we possibly can to be sure we are pushing all the way to the end of the Finals." 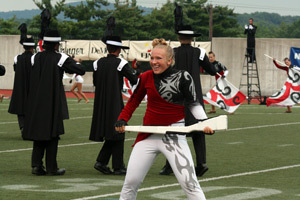 The Crossmen moved their home base from the East Coast to San Antonio in 2006, but Huber said many members are still from the area, and because of that, J. Birney Crum stadium is one of her favorite places to perform. "We had an alumni picnic earlier today, and a lot of alumni came out to watch us in the lot and get us hyped for the show. We had a huge reaction in San Antonio, but I would say the reaction here is just as big if not bigger in Allentown. It's a second home," she said. With the World Championships up next on the Crossmen's plate, Huber said she is excited to stay in one place for a while. "We've had some long, long bus rides these past couple days and five shows in a row. It's going to be nice to get some real rehearsal time in. And it's always great to spend the last week with everybody remembering all the good times we had this season."